Sounds simple enough. yes? But there is a knack to a good roast dinner, and I was reminded of this when one good friend commented on how tasty the chicken was. So, here's my approach. All learned (with apologies to Tom Lehrer) at my Mother's Knee - and other low joints. Ingredients for cooking Roast Chicken Dinner Use the best-quality whole chicken you can find. Remove any string or elastic holding the wings and legs together. Wash thoroughly inside and out, removing (and retaining) any fat which may be still inside. It's important to use a trivit - a raised rack which keeps the bird out of the juices. 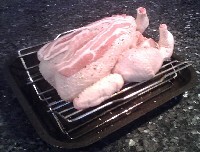 Make sure the pan and trivit are big enough for the bird - and will still fit in your oven! Make sure the oven is thoroughly pre-warmed to 200 Celcius (Gas Mark 6) - otherwise your cooking timings will be thrown out. Place the bird on the trivit. Optionally, stuff the body of the bird with a whole lemon; before inserting the lemon, cut off the top and bottom and score the rind in many place. Pour a little vegetable oil over the chicken skin, and sprinkle with plenty of salt and pepper. Cover the breast with a couple of slices of streaky bacon (optional) and any fat saved earlier. Put just enough boiling water in the bottom of the pan to just cover it. Place the pan in the pre-heated oven. There's much debate around cooking times and temperatures. It's really important to ensure that the bird is thoroughly cooked through - raw chicken is not good for you! - but you don't want it to dry out. I prefer 200C (Gas Mark 6) and timed at 20 minutes per pound plus 30 minutes. I like to baste the bird a couple of times while it's cooking, which keeps it moist and tender. The water added to the pan also prevents the chicken from drying out too much in the early stages of cooking. Ingredients for cooking Garden Peas Traditionally, vegetables would have been cooked to death, and served with lashings of butter. These days, I tend to replace the butter with a little extra virgin olive oil, which certainly adds a great taste. I tend to serve peas with roast chicken, usually using frozen peas for convenience. Place the peas into a microwave-safe dish (one which is also suitable for serving at the table) - use a small handfull for each person. Add enough water to form a quarter-inch layer, just a little salt and a good splash of quality olive oil. Top with a sprig of mint from the garden, if possible. I also tend to serve mashed potatoes with a roast chicken dinner, which delightfully soak up the gravy, as well as other microwaved vegetables. Ingredients for cooking Chicken Gravy One thing that treally makes a roast chicken meal a treat is the gravy. Traditionally, gravy with roast chicken is described as "thin", but my Mother would never stand for this notion.  Mother claims that she had the same gravy for 30 years, made from stock from previous days, and added to from the leftovers from today's meal. You could stand a spoon upright in it! These days, I'm also avoiding wheat (since Tracey is allergic to it). So, this gravy uses only cornflour. Start by reducing some red wine. (Yes, I know, white wine with chicken...) I usually seem to have the dregs of a bottle kicking around in the kitchen, for some reason. Pour about 1/4 pint into a small saucepan and boil until it is reduced to half the volume. Cool slightly. Add the juices from the chicken pan to the reduced wine - I tend to use a turkey baster for this. If I have any, I'll also add half a pint of chicken stock from the freezer. Or, you can just use a chicken stock cube and the same amount of water - perhaps the water used to cook my Brussels Sprouts? I also tend to add some Worchester sauce for colour and flavour at this point. Once the gravy is boiled, pour into a jug and keep warm. Serve with the chicken and vegetables, like the Brussels Sprouts. I find that cauliflower cheese works well too.